This security poster illustrates the PT-Mi-Ba-III Former Czechoslovakia Anti-Tank Mine. This circular mine was constructed from Bakelite. This anti-tank mine is a minimum metal mine and can be deployed with a variety of initiators. This security poster features illustrations and descriptions on how to disarm the PT-Mi-Ba-III anti-tank mine, the technical specifications, description, and fuzes of the PT-Mi-Ba-III Czech anti-tank mine, the PT-Mi-Ba-III brown Bakelite, a sectioned PT-Mi-Ba-III anti-tank mine, and the base of the mine. This security poster also shows a sectioned RO-7-II fuze, a sectioned RO-7-1 fuze, and the RO-4 and a sectioned view of an RO-4 fitted to a 400gm Trotyl demolition block. A sectioned PT-Mi-Ba-III anti-tank mine. The RO-4 and a sectioned view of an RO-4 fitted to a 400gm Trotyl demolition block. The base of the mine. Illustrations and descriptions on how to disarm the PT-Mi-Ba-III anti-tank mine. The technical specifications, description, and fuzes of the PT-Mi-Ba-III Czech anti-tank mine. 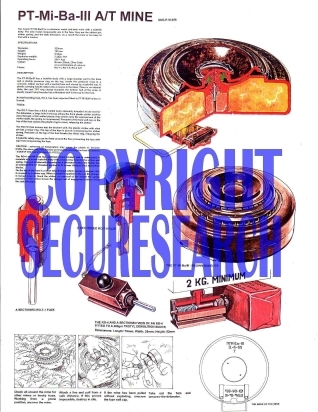 This security poster features illustrations and descriptions on how to disarm the mine, the technical specifications, description, and fuzes of the mine, the PT-Mi-Ba-III brown Bakelite, a sectioned and base view, and a sectioned RO-7-II fuze and RO-7-1 fuze.